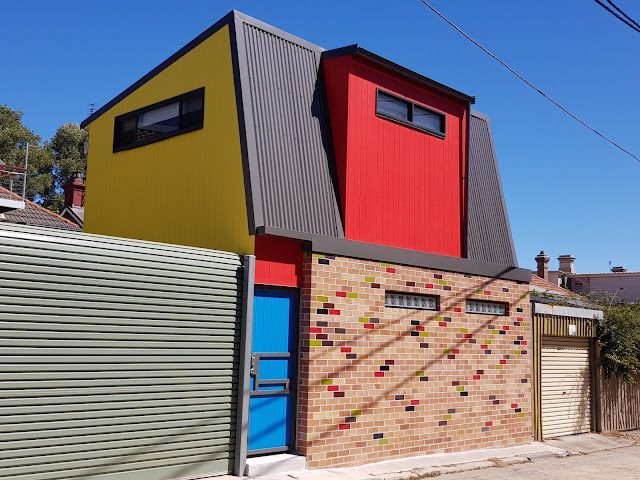 This contemporary building has been built at the rear of a property along Holmwood Street, in the inner city suburb of Newtown. With separate access here from Alice Lane, it seems to be a granny flat, so called in Australia for self-contained accommodation suitable for an elderly relative,. What an interesting design especially the use of coloured bricks. Never heard about that before. Unusual architecture. I really like the look of it, Jim! We are seeing more and more of this type of building springing up along lane ways in the older parts of Toronto. We call them granny flats often too. Love the sense of whimsy about this house! That is one nimble Granny to get to the second floor! Cool photo.